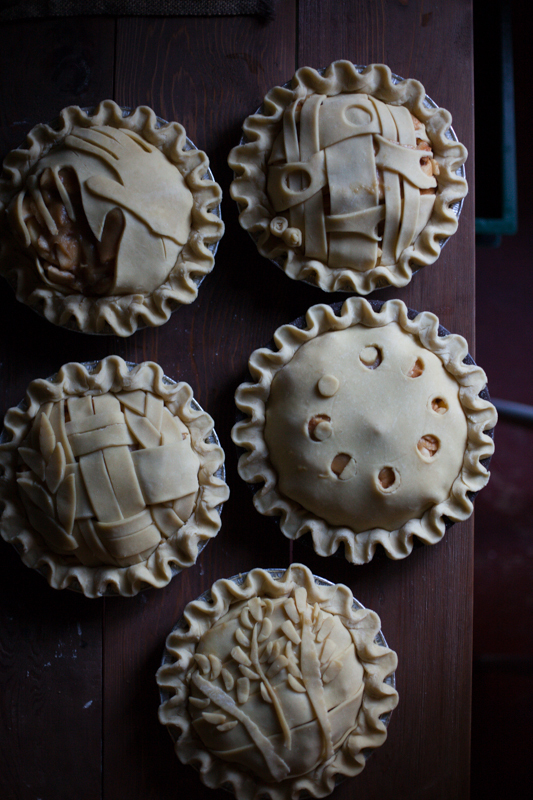 - Rosehip honey and Cajeta Apple- Pies are an important part of what is happening over here. From an art background, to baking and pastry school, to working at Four and Twenty Blackbirds - something has fairly clicked with making pies, and I'm pretty hooked. Upon my move back out to the northwest I've found myself, in varying homes, baking away, trying to perfect a crust recipe, paying attention to the subtle differences in technique, ingredients, refrigeration. I love that pies are such a perfect combination of the grounding and connecting that comes with baking, and the creativity that comes with having a round, blank canvas and a sculpt-able, buttery medium. I love brainstorming up new flavor combinations and decorative tops. Each part is special really, the foundations of making the crust, rolling it out, buttering pans, to creating fillings, adding spices, and then the decorative lattice work, or stencil making, to finally baking it all off. For the Cajeta Apple pie I'm using goat's milk from a farm nearby and cooking it down with organic unrefined sugar to make a goat's milk caramel - cajeta. Then one scoop of that goes onto the spiced apples and it's all bundled up in lattice. For the rosehip honey we wildcrafted rosehips from around the home and infused them in northwest honey, processing the rinds into the filling to make a fairly sweet and decadent custard pie with a subtle taste of rosehip. All pies are made using local and organic ingredients. The crust is made using organic, unbleached white flour, milled nearby at the Fairhaven Cooperative Mill. A whole grain crust recipe using island milled flour is in the works, amongst a few others! All pies can be ordered online or via e-mail at demetria.theophania@gmail.com and are available for pick up or delivery in the San Juan Islands. So, if you live in the San Juan Islands, I'm making pies for a bimonthly little winter market here, and I'm taking orders for pick-up or delivery in the area. And if this all goes well stay tuned for a pie CSA in the new year!